CDs can be purchased online via PayPal using the link below. Josh and Nathan debuted Clouds, their EP featuring beautiful folk songs from Burma, at our Savile Club event on September 30th. Originally performed by Soe Paing. Originally performed by Win Oo, composed by Myoma Nyein and classical interpretation composed by Hannah Varty. Originally performed by Sai Htee Saing and composed by Sai Kham Leik. All tracks were recorded and produced by Dominic Hammond. Josh Htet is an alumnus of the Prospect Burma scholarship programme and also a trustee of the charity. He has sung Burmese folk songs since childhood. Josh performs traditional and modern folk songs which have inspired millions in Burma, and has appeared at various well known venues across the UK including Christ Church Spitalfields, 93 Feet East and Greenbelt Arts Festival. Nathan Williamson is a highly acclaimed pianist, and has played at concert venues all over the world. His own works have been performed frequently across Europe and North America, and he is constantly in demand as a composer to create new pieces for performance by other artists and orchestras worldwide. 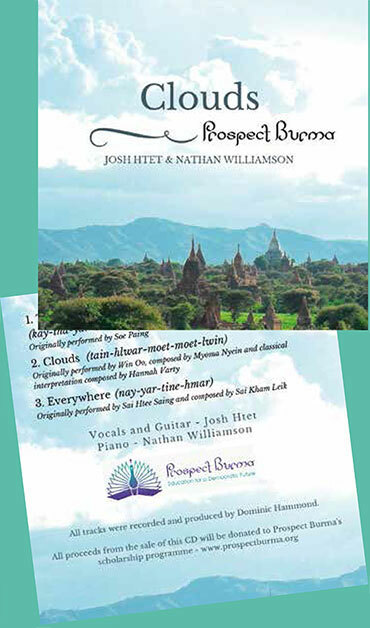 All proceeds from the sale of this CD will be donated to Prospect Burma’s scholarship programme.